Monday, 5th March 2012. The FBM KLCI rose to seven months high yesterday as it continue to extend its preceding uptrend this month. Most regional indexes also ended in positive ground. Other news to follow. "- U.S. stocks notched minor losses Friday as investors eased out of a market that's recently hit a slew of milestones. The Dow Jones Industrial Average DJIA -0.02% lost 2.73 points, or 0.02%, to 12,977.57. It lost 0.04% for the week, only its third weekly loss this year. Midweek, the blue-chip index closed above 13,000 for its first time since 2008. The S&P 500 SPX -0.33% ended down 4.46 points, or 0.3%, to 1,369.63, up 0.3% for the week. On Wednesday, the index wrapped up its best two-month start to the year since 1987. The Nasdaq Composite COMP -0.43% ended down 12.78 points, or 0.4%, to 2,976.19, up 0.4% for the week. The index this week passed the 3,000 mark, a first since 2000." "Asian shares rose Friday, with financials joining in global stock gains for the sector, as markets digested mostly positive developments from overseas. Hong Kong’s Hang Seng Index HK:HSI +0.81% advanced 0.8%, while the Shanghai Composite Index CN:000001 +1.43% rose1.4%. Japan’s Nikkei Stock Average JP:NIK +0.72% rose 0.7%, South Korea’s Kospi KR:0100 +0.22% added 0.2% after a holiday Thursday, and Australia’s S&P/ASX 200 index AU:XJO +0.41% closed 0.4% higher." "-Crude futures on Friday reversed the previous session’s rally after a denial that a pipeline was attacked and as the U.S. dollar strengthened. Light, sweet crude for April delivery CLJ2 -2.15% fell $2.14, or 2%, to settle at $106.70 a barrel on the New York Mercantile Exchange. On the week, oil declined 2.8%, snapping a three-week string of gains that included a 6% advance the previous week." "-US soy futures rallied for the tenth consecutive trading day, fueled by expectations smaller South American crops are generating more US export demand. USDA reinforced that trend Friday, announcing fresh sales to unknown destinations for both the current marketing year and upcoming year, which starts in September. The "day in and day out" announcements of export sales of soybeans solidified trader ideas that government forecasters may be underestimating US soy demand forecasts, said Terry Reilly, analyst with Citigroup in Chicago. Soybean market has jumped 12% since Jan 30. CBOT May soybeans ended 10 1/2 cents higher at $13.33/bushel. Soy-product futures end mixed, with a big push in traders buying soymeal against soyoil on spreads action. Soymeal is rallying in step with soybeans as increased export demand tightens soy supplies, making soymeal more expensive to produce. But soyoil fell, succumbing to broader weakness in the energy pits. CBOT May soymeal ends up $3.60 at $359.10/short ton while May soyoil drops 0.19c to 54.08c/pound. 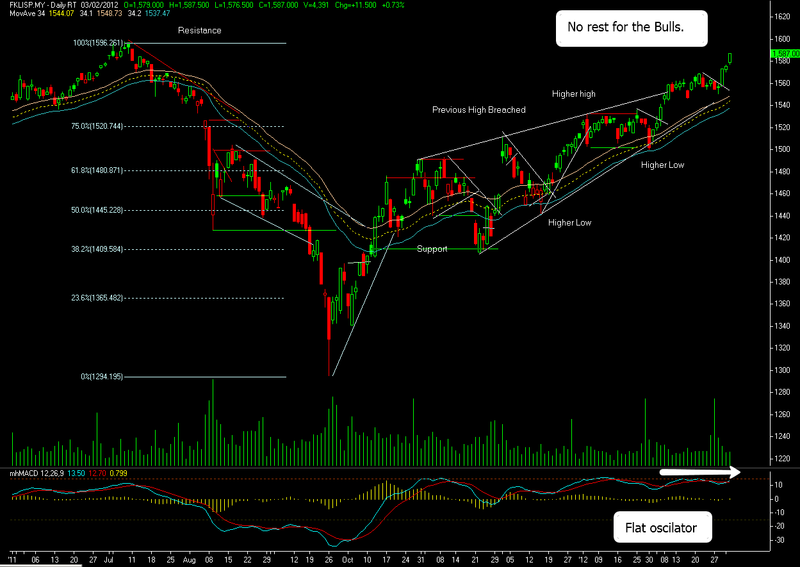 FKLI- Bulls Need To Rest Somehow. Stock index continue to reap more gain from the market recovery as index futures closely trailing ahead. It was a strong recovery last week where the index futures is just meters away from reaching the all time high at 1,600 level. On previous Friday, the stock index rose about 10.33 points or 0.66% to 1,583.78 level while March contract went up about 11.50 points to 1,587 level, closing at the day high. Although the market is still hovering on positive momentum, most of previous Friday gained are deem as excessive. There is nothing wrong with a price rising swiftly on an uptrend but it needs to be checked regularly. The points is, with such recovery at this pace without the presence of higher volume and open interest, the market might be ascending on "depleting fuel". But remember that the market can stay at overbought reading for quite sometime before it correct again. Thus, traders need to beware if the index futures does break out above the all time high around 1,600 because this break out is made with "depleting fuel". More traders would like to shed off their Long positions on that level, rather than to add up more position at that moment. Technically, flat oscillator with rising price is likely signifies price divergence. 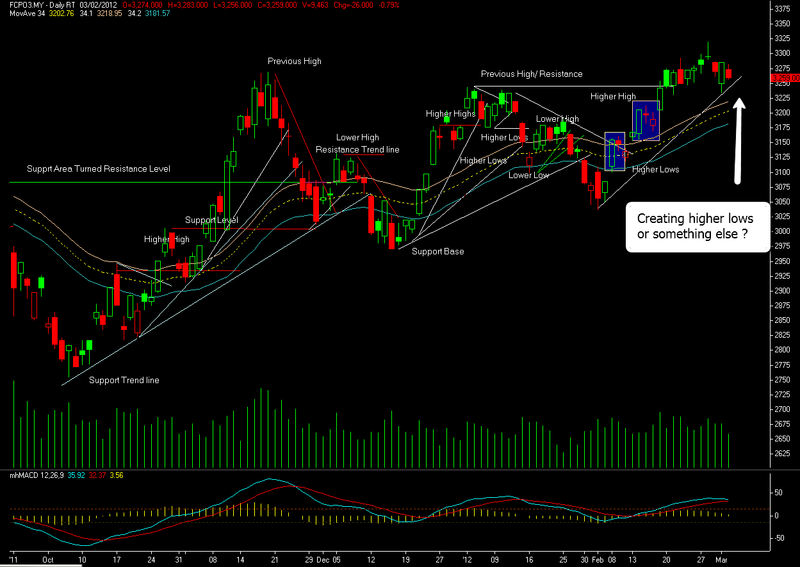 For today, support is likely located around 1,579 while resistance is pegged at 1,594. FCPO- Support Trend Line, Watch Out. CPO futures ended on lower note previous Friday paving way for some sideways movement for this week with special attention to be pay on current support trend line (daily chart). If palm oil prices does not decouple too much from its rival products, some mild retracement is expected for this week as Soya oil futures is likely retrace further due to Bearish candle formation on daily chart. If this event continue to materialize, it is time for palm oil futures to retrace after rising for at least three weeks. At close, the benchmark May went down about RM26 to 3,259, closing just 3 points from the day low. It is a strange sight as there was no follow thru Buying activities on previous Friday even though Buyers manage to push the price higher than 3,280 after it correct to 3,233 level on previous Thursday. Technically, market is coming to a crossroad as one of the path is leading to more correction if the benchmark May retrace lower than the support trend line while another one will be sideways movement within 3,250~3,280. Nonetheless, medium term uptrend remain intact but traders are advised to pay attention as further correction is expected if the benchmark May does breach below the support trend line on daily chart. For today, support is likely located around 3,239 while resistance is pegged around 3,276.